Who is Colin Videlock? Colin is Techno Goober’s newest employee. He’s been with Techno Goober for only a few months, but already he feels like part of the family. However, as an identical twin, some team members have expressed concern over whether Colin is really Colin at all. Colin is our resident CSS code expert. Although, he prefers to describe his job as “sitting at his desk writing code with headphones on.” His favorite part about working at Techno Goober is the atmosphere. 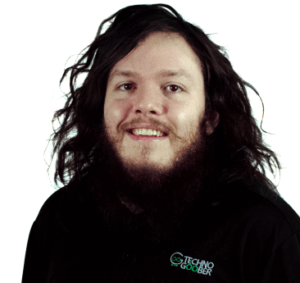 That’s code for “there’s beer in the fridge.” Learn more about mobile web design and custom coding from Colin. On a scale of 1-10, Colin is a solid mashed potatoes and gravy. His favorite memory from working at Techno Goober (so far) is the Christmas Party at Shell We Bounce when he failed at jousting. Keep up with Colin and the other Goobers on the Techno Goober Blog.